I take and edit a lot of photos. I have over 100,000 images in my Lightroom Catalogue. Over the years, I became more efficient in organizing and editing. Now, when I return from a long photography trip with 4,000 new photos, it does not scare me at all because I can organize and edit them relatively quickly in Lightroom. 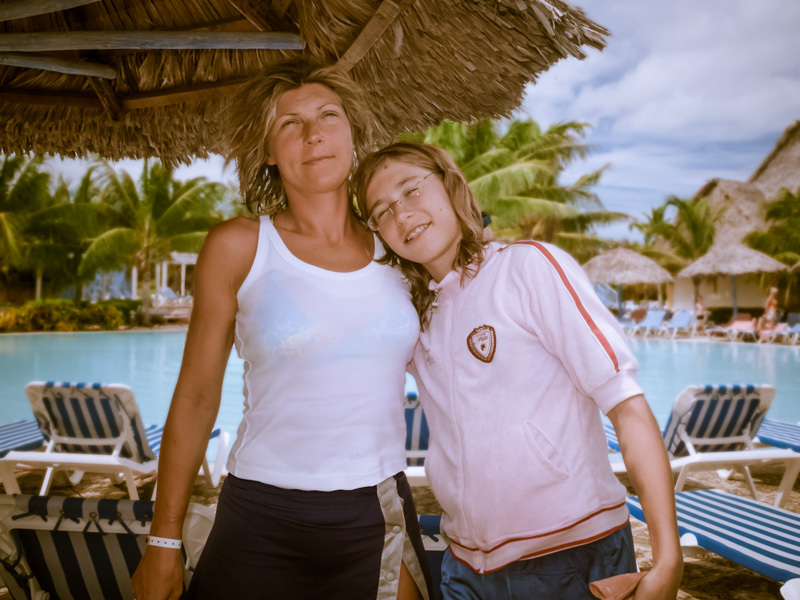 But, one aspect of photography with which I struggled for a long time was family photography. Every time I returned from family vacation, I was always behind on my work and family photos were never the priority. 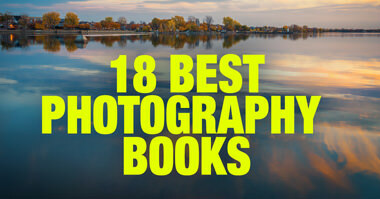 Plus, the fact that family photos typically never have a hard deadline was also of no help. The photos often stayed on my travel hard drive for weeks or even months, which did not go over well with my wife and the rest of the family. My wife kept calling me a “shoemaker without shoes” (Russian idiom). At some point, I decided to take control over probably the most important part of my photography. 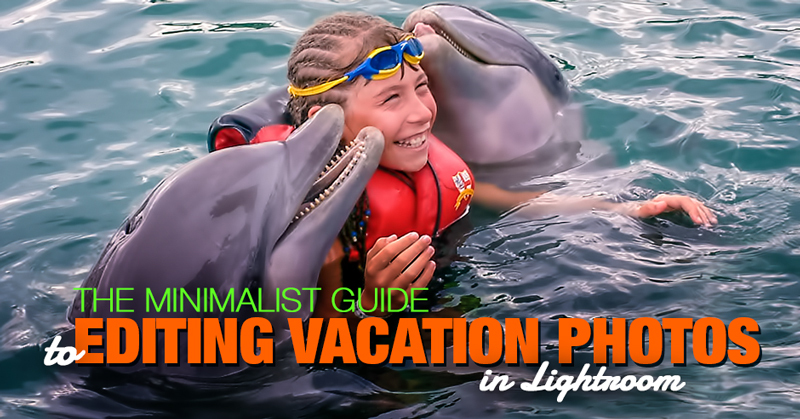 I came up with a system that allows me to process and publish vacation photos in just a couple of hours. My wife and my mom are both happy and, now I have a reputation of being an exemplary husband and son who takes care of family photos in no time. The system is based on the Lightroom organizational system I described in great detail in the following article: Lightroom Organization in 3 Simple Steps. Here is a real life scenario. I returned from a family vacation in Cuba and I have 400 family related photos on my SD card and I need to organize, edit and publish them as fast as possible. Here is the outline of the process I use. 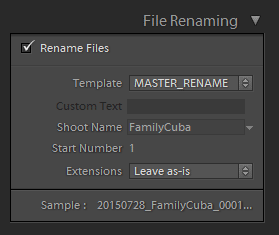 I create a new folder on the hard drive and name it “2015-Family-Cuba“. You can create new folder from Lightroom or you can use Explorer (PC) or Finder (Mac) and create new folder through the file system. I prefer the later. I find it to be faster. 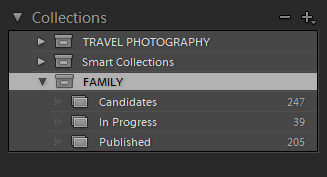 In Lightroom, I import all of the vacation photos into the newly created folder. I apply only two tags to the entire import: “Family” and “Cuba“. I rename all of the photos during the import using a previously created and saved template. Now, if I come across a photo file on my computer I can tell exactly when and where it was taken without opening it or checking the meta data. In the Library module of Lightroom, I go through all of the newly imported photos and, using the keyboard shortcut “X”, I mark all unsalvageable photos (out of focus, shaky hands photos, accidental photos). After I finish, I delete them right away. I go through the remaining photos again and, this time, I use shortcut “F” to flag (F stands for FLAG) all the photos that I like and plan to share with the rest of my family. As a general rule, I try to keep the number of “keepers” under control, going for quality and not quantity. I seldom publish more than 20-25 photos from each vacation. It drives me crazy when people publish 43 variations of the same photo. I try to avoid it. When I am done, I select all of the flagged photos and drag them to the FAMILY CANDIDATES Lightroom Collection. For the detailed explanation of the Lightroom Collections structure please check my tutorial here. At this point, my ORGANIZATIONAL part of the processing is over and I am ready to move to EDITING. My editing process is based on a Lightroom Rapid Editing workflow which I outlined in the following tutorial: Introduction to Lightroom Rapid Editing System. I switch from the Library module of Lightroom to Develop. Out of the flagged photos, I choose the best one, the one I am most proud of. I start applying various presets from my PEOPLE Preset Collection as I try to find the most interesting look. When I find something I like, I try to fine tune it using the ToolKit Adjustments first. 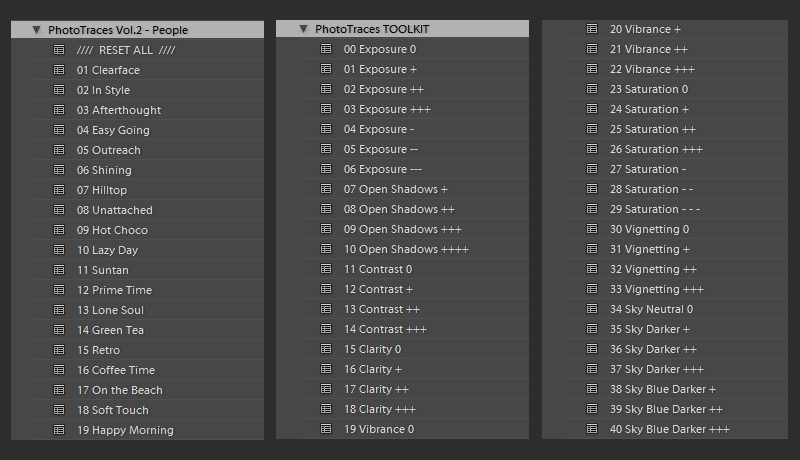 If ToolKit is not enough, I might dive into the right panel of Lightroom where the main editing tools are to help me achieve the intended look. For the detailed explanation of the Lightroom ToolKit Adjustments please check my tutorial The Minimalist Guide to Lightroom Editing. Let’s say I like the effect of the Suntan preset the most and I want to use it as the base for the rest of my vacation photos. Using the Presets Panel of Lightroom, I create a new preset based on the photo I just finished editing. 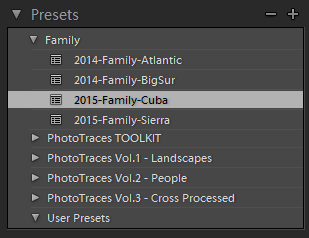 I name the new preset something like 2015-Family-Cuba and save it into the Family Presets folder. 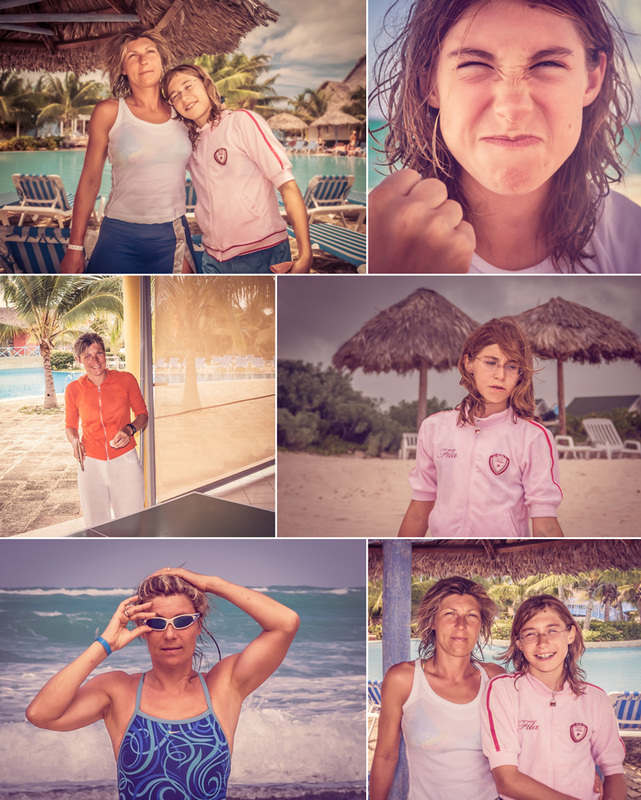 I select the rest of the flagged photos and apply the new 2015-Family-Cuba preset to all images. I go through the photos one more time using only the ToolKit and focus on each photo individually. At this stage, I mostly adjust the Exposure and Open Shadow compensating for different lighting conditions in the photos and the exposure imperfections (underexposure and overexposure). This process does not take long, on average 10 – 15 sec per photo. This editing approach allows me to process high volume photos in a relatively short time and also to have a similar “look” and “feel” for the entire set making it distinguished and unique. When I am done with the editing, I am ready to publish my brand new collection. 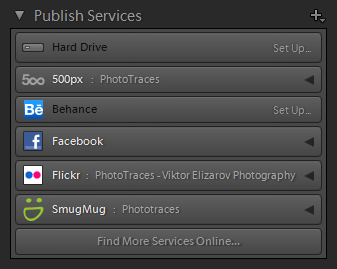 I use Lightroom Publishing Services panel where, with the help of the plugins, I can integrate Lightroom with various online services, such as SmugMug, 500px, Facebook, Flickr. 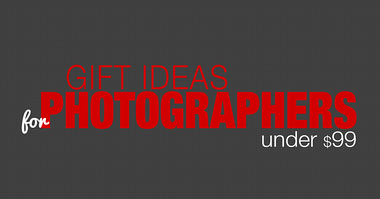 Lightroom plugins allow me to keep all of the original photos in one location and, with the click of the button, publish them to different destinations. And, if at some point I have to modify a photo in Lightroom, I can easily update it everywhere with the new version. The new approach not only helped me to cut processing time of my family photos by a factor 4 or 5, it also helped me to develop a new habit of editing and publishing them as soon as possible without delay. 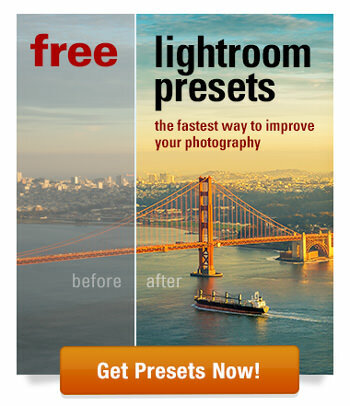 Please note, even though I used PEOPLE Lightroom Preset Collection which is the premium product, all subscribers of my newsletter have access to Free Lightroom Preset Collection which comes with the ToolKit adjustments. The Free Collection can be downloaded here. Interesting and very helpful instructions. I think I am going to do a better photography with my photos. Thanks a lot.